The disconnect between the outright giddiness of slots-fuelled large purses for claiming races and economic reality has long been a bone of contention for many in the sport, me included. If a stock has an increase in earnings, the price of it goes up. It's how the market works. Horses at a fixed cost, suddenly racing for 3X or more the claiming price, tries to put a square peg in a round hole. It turns animals into commodities, can and has attracted the lowest of the low to this business, and it should never have been allowed to happen. Joe Drape looks at the phenomenon today in the New York Times. People complained about the methodology of the last New York Times article, and they had a point. However, the shoot the messenger strategy with this article should not happen. This one is all on us. What did you know and when did you know it? Regulators look at NYRA takeout snafu. There are those out there who judge a racetrack by its driving colony and quality of horses. I guess it depends how you keep score. Balmoral Park, the track that attracts gamblers by carding good racing at a fair price, gave out $99,000 in purses on Saturday. Yonkers, with the best horses and the best drivers, gave out $1.1 million in purses on Saturday. The handle scorecard? Balmoral $1.33 million, Yonkers, $1.19 million. Imagine you have a Derby starter who looks lights out the best. Although you did not win the Juvy (your horse didn't race at two), you're undefeated, ran a couple of 118 Beyers, with 22.4 last quarters. Your colt even ran that in the Wood while 6 wide the whole way around. It may be a coronation the first Saturday in May, you're that good. The gates spring open for the Derby. Your colt, leaving from the rail, gets a nice run into the first turn. Sitting 11th, he moves out and circles the field running a 23 flat, making a comfortable lead in 47.4 (easy for him, because he's that good). Then the impossible happened. Calvin Borel is trying to scoot up the rail with a 142-1 shot (who is on the board at 8-1), veers out into a Pletcher horse who runs right into your colt and puts him into the outer rail. You've lost about 30 lengths, but, he is so good, that he picks himself up, catches the field, circles it again, and loses by a head. Someone somewhere will say your horse lost the race because he didn't race as a two year old. Someone somewhere will say you lost the race because post one in the Derby is a death post. For the latter, well, Derek Simon is doing better work than I could on that. He's doing what our post on Supercrunchers says to do. People likely still won't believe him, because of a world-view. However, it's as plain as day. Post one is not a death post. It's probably not exactly wonderful (what inside post is in a 20 horse field? ), but if you are "chucking" a horse out from there, or if you are being Mr. Hyperbole like Baffert was a few years ago when he drew it, you should reevaluate what you're doing. For the former - that no non-starting two year old has ever won a Derby - it is equally frustrating for stats folks, I guess. But, like Derek's post on post one, it's simple statistics, that Gary West talked about on Friday. Bodemeister didn't race as a 2-year-old. Not since Apollo in 1882 has there been a Derby winner who didn't race as a juvenile. But of all those who tried, how many were contenders? Well, not many, as it turns out. Of the last 47 Derby starters who didn't race as 2-year-olds, only Air Forbes Won (5-2 in 1982) was the betting favorite, and he probably shouldn't have been. Of the 47, 24 had odds higher than 20-1, 10 were included in the mutuel field and another, Trippi, would have been a long shot if he hadn't been part of an entry. He goes on to say that decent looking colts, like Pulpit, fractured a knee. When you subset things in racing as a handicapper, you have to be pretty crafty, and act like a statistician or you'll get your head handed to you. With the "1882 Curse" we are subsetting bad data. And it's fairly logical. If a horse does not race at two, it's because he or she is not ready, had a setback of some sort, and needs time. The colts who do race at two are on schedule and have very few physical issues. As West shows with the odds, these horses may have been rushed to the Derby, and weren't very good to begin with. The others, like Curlin? Well, it's not a Derby curse, it's the Derby itself. If you have ten capable-of-winning horses that fit the subset, who get into the gate over 130 years, and all of them lose, it's not a statistical anomaly, it's statistically expected. Each Derby is a unique event; in fact, each race is a unique event. Just like you don't bet a favorite because they win 33% of the time and in race 6 of the day no favorite has won, you don't use rules like the above two to guide you. If you are betting the Derby like so many of us will be in a week, look at the horse, look at his works, look at the rider and the pace and the 10,000 factors that go into handicapping a race. But don't look to media driven rules. They might be right this year or next or the next, but if they are, it's a normal distribution of events that's making them right, not statistical evidence. I've been reading the press, some sharp bettors and twitter for the past week or two, and conventional wisdom says the big Beyer horse - Bodemeister - will be chalk for Derby 138. Some even think he'll be as low as 3-1. 1 - The buzz on this colt is still stout, despite the loss and the lack of a big 2012 Beyer. The clocker types are going ga-ga over him. 2 - Familiarity breeds betting dollars. Last year in the Juvenile, a million or more viewers watched him, and thought he was miles better than Hansen. Not a day goes by it seems that someone says he traveled further than the circumference of Mars more than the winner. There are fans, both casual and rabid, wanting to see him get revenge and make the Trakus number look like gold. Think Zenyatta. She was 4-5 against Blame in the Breeders Cup Classic. Everyone saw her close from St. Louis to almost run him down. She'd probably would have been 1-5 in a rematch two weeks later. People love closers who almost win. 3 - The "Trip Over The Track". Churchill can be quirky, and loving Churchill - which he seems to - makes him a formidable first choice. 4 - He's currently the chalk in offshore books and at Betfair, despite the Bode-Beyer talk. Unless Bodemeister draws an advantageous middle post, and Union Rags draws outward of 17 or the rail or two hole, I think he's a slam dunk for favoritism come the First Saturday in May. Derby News, or Super Bowl News? The NFL might have sixty players to chat with, and a game watched by a billion people, but they don't have 20+ horses, trainers, grooms, owners, and tons of fans ready to bet $100 million on a race chatting them up. This news cycle has been pretty astonishing, and opinions on who will win the big race can change by the minute. Perhaps you liked I'll Have Another on Tuesday, getting ready to key him in exotics, looking for a nice score. On Wednesday you found out he was shocked in his back end, so you ripped up those tickets. Then you read it was "routine and simple maintenance treatment for blood flow" and said "well, maybe I'll keep him keyed". Then you read bettors and owners talking about how it is anything but routine for a horse to be regularly shocked. Rip up those tickets again. I bet you loved Bodemeister and saw a glowing workout report. Alrightee, let's roll. Then you saw another opinion that he looked kind of sore. Rip em up. You saw a wonderful report this morning on Take Charge Indy. That's a Derby horse! Then you were reminded that Calvin Borel was on him and you know you're not going to get the best of it on the odds board. And of course, you could easily fall back on the "tweeting horse angle" too. The last thing you want to do is bet a Pletcher horse in the big race, with his 1 for like 30 record. But you saw Elliot Walden compare Gemologist with Tiznow today, so you're back aboard. Workout or not, let's all ride the 108 train to Bodemeister-ville! Whoops, Trinniberg is now in. You think you've found your longshot on Daddy Nose Best, so you get ready to take a payday loan. Then you've found dozens of others thinking the same thing, and you're suddenly on a wise guy horse. You're off the favorite Union Rags, because, well he couldn't run by Calvin Borel and Take Charge Indy. You're back on yesterday when you read on twitter that the sheets guys like him. You went to bed on Monday thinking that trainer change to Assmussen for Isn't He Clever is a neat angle to use at bomb odds. Then you read he ain't even going. You figure the Derby is so contentious that you're excited to bet a horse at 150-1 and roll the dice. Then you remember that since Mine That Bird, Derby horses who should be 150-1 are 45-1. .......... and of course...... The Derby is still ten days away. I got most of the above via Goatzapper.com . One of those goats is a Derby news fiend. Derby Day is a little more than a week away and I'm waxing melancholic about the whole affair, just like I do each year. My Derby day is pretty simple for the most part. I have my sheets, the PP's, speed figs and trip notes scattered across my desk and on two computer screens. I have my browser open to about 40 websites. I have three ADW accounts open, exchanges open for clues. I use the track feed all day, because I don't have time to look at a red carpet interview or a human interest story, and for gawd's sakes I don't want to miss a post parade. Then I bet, and bet, and bet some more. After the race I share a story or two, the odd time (like when Closing Argument lost) commiserate with a gambling friend or two, then I usually watch the harness races or NHL Playoffs at night. I read this morning about Men's Derby Hats, and Derby recipes. I hear about people having others over to drink a Mint drink and sing along to the Kentucky Derby song. I hear people talking about an interview or Mike Battaglia. I hear people speak of what horse the dude with the free bet takes, what that guy in the background is wearing, or who on TV is saying what about a track bias. It sounds like a lot of fun. It is a lot of fun, I'm sure. It's just not me. One day I'll just be a fan. Maybe next year. Thank goodness Betfair is doing some things in the US. Without them I would get fewer Jerry Jamgotchian emails in my inbox calling them names reserved usually for axe murders, and certainly fewer laughs. It bubbled to the surface during a California Horse Racing Board meeting at Santa Anita on March 22, interestingly, the day before Everett, 90, died. In attendance were Hollywood Park Chief Executive Jack Liebau and the U.S. chief executive of Betfair and TVG, Stephen Burn. Burn was there to observe and support Liebau. He said he was somewhat taken aback by what he saw and heard. "It seemed to me," Burn said, "to be a bunch of old men telling Hollywood Park how to market to young people. There was a lot of public showboating, and the advice they were giving was not very good advice." Racing has had 135 years to get the younger generation interested in racing. It hasn't worked. Give some one else a shot. Brennan looks at what happened last meet, and what's new for this meet at The Meadowlands. Allan and the boys at HANA Harness have their pen and chip challenge starting this weekend. There'll likely be a few PP links and other handicapping items on the site. There's more chatter on the New York Times story, this time from Mel Moser.He makes some great points, but once again, it's futile. This is not a Global Warming debate where a Phd can write a paper showing man has caused it, and another can write one showing it's perfectly expected and natural. This is a newspaper writing a story showing 5 horses die for every 1000 starters versus an industry who wants to say the number is closer to 3 per 1000. It's okay to debate, and Mel makes great points, but if we think we're going to shoot the messenger into submission over a disputed number, it's never going to happen. San Pail lost his second race in a row for the first time since 2009 last evening. We surmised on twitter and here that he was not quite the same horse after his second start, recommending a bet against him, and I think that's proven to be correct. In that second start he was less keen - gapping at the half and had to be asked - and he had to work to get by the pacesetter off as dreamy a trip one could ask for. He usually is on the muscle and very keen in fast splits and has been that way throughout his streak, or even his whole career. Giving him one more chance was easy - sometimes horses aren't at their best for one race - but I think last night and last weeks loss has confirmed it. He's still a really nice horse and should win a bunch of cash this season, but for anyone expecting another Horse of the Year type year, San Pail is telling you something different. Moreso in harness than thoroughbreds, getting to know a horse's action, and how he or she races is most important. If you look at a teletimer it can show a nice time or an okay last quarter, but how a horse does it is more important than what the clock shows.It's worth watching replays, and it's worth comparing them to old replays with good efforts. Sometimes it can really pay off at the windows. Watching how keen a trotter is, is one of the very best handicapping items in the toolbox. I read with interest this morning Jennie Rees' story on Kentucky Derby 138. She says "If the strength of a field can be determined by its lowest rung, consider El Padrino in the May 5 Kentucky Derby." El Padrino was a hot horse earlier this year and one which is still feared by many. He'll likely be a longshot. The Derby may be an exception of course, but it does illustrate something that you and I find common sensical, that racing seems to grapple with: Card a race worth gambling on, and people will gamble on it. If we look at handle losses the past ten years, we see places like California, who carded (and still does to some extent) races for owners, instead of bettors. You could not go one week on a chat board and not see a player complaining about four and five horse fields; there are literally thousands of posts on the subject at places like Paceadvantage.com. California all source thoroughbred handles lost upwards of 50% the past decade - yes, half their business. Plus, they've had two takeout increases. It's arguably the most unfriendly jurisdiction to customers in North America. Conversely we see places like Keeneland - the contrast is stark. Some folks will say well, yes, it's Keeneland. They've got it all. But it's not the case. Look at Balmoral Park in Chicago. Handle is up 35%, and nightly it is not far off Woodbine's handle. It's higher than what it was 5 years ago (what recession?). Purses are small, it's not a short meet, it doesn't have a Kentucky Derby. There are no slots churning in the halls of the track. There are no bands or food truck parties. Kegasus isn't greeting customers, there are no daily cap or bobblehead giveaways. What they do is something quite simple: They card races that bettors want to bet, and they do it at a fair price. "We want everyone to know we're a good gamblers track" said the track marketing dude. When you card races for your horsemen's group, or board of directors, you get some pats on the back and a couple of "atta boys". When you card races for your customers, you get customers. Mike Welsch of the DRF is reporting this morning that Trinniberg will likely be entered in the Derby in two weeks. This horse, a sprinter, has looked like one of the most talented speed horses we've seen in some time. He is exciting and he's fast. Why go to a 10 furlong race with such a fine speed specimen? I don't really know, but I imagine it's the Derby allure that's rubbing off on the connections. It makes people do some otherwise strange things. Maybe the colt is so good that he shocks us and becomes a Triple Crown threat. If so, many of us will eat crow. But on paper, this decision feels yukky. This morning on Goatzapper.com screamed a headline about a Pig and TVG.The story involves Twinspires' "Quarter Hog" letting people know about TVG's 25 cent wagering fees, and the fact that TVG initiated a cease and desist order. I don't think the Quarter Hog idea was a bad one, but it wasn't exactly setting the world on fire, despite the huge money spent on its marketing. However, as is the case so many times in marketing, some catalyst does tend to set it on fire. This time it was TVG - doing it to themselves. I'm no Twinspires fan for various player-centric reasons, but boy, did that pig ever slay TVG today. I read with interest the section of HRU, "2 minutes with" where thoroughbred trainer Barry Abrams was interviewed. Barry, as you all know, was a top trainer in harness racing in the 1980's with horses like the venerable Guts. It’s much easier to train thoroughbreds. It helps to be a horseman to train thoroughbreds but you don’t have to be a horseman. That’s because you can hire people to do everything for you. In standardbreds, you have to know how to sit behind them, shoe them, train them yourself; you need to know about the sulky and all the other equipment. With thoroughbreds you just need to throw a saddle on them. If a thoroughbred trainer switched to standardbreds they wouldn’t do any good because they wouldn’t know what to look for. This is something that always amazed me, and amazes people like Beyer. Let me ask you, if Joe Blow gets a problem trotter and puts him back in after 2 weeks and he does alright, he is a "juicer". If a thoroughbred trainer does it, he's a decent horsemen. Does this make sense, on the surface? The harness guy could've added toe weights, trotting hopples, trained the horse in a pack to settle him down, schooled him twice, changed racebikes, changed to a Kant See Back, adjusted the shoeing three degrees or changed them to about 100 different kinds, and numerous other things. What's the thoroughbred guy do to get the horse to improve 20 Beyer points in 14 days? Of course there are a few things, but in general, I'm with Beyer: It's the vets that are improving these horses in some stables en masse. It's the only thing that makes rational sense. Before you jump on me with anecdotal stuff, I, like Beyer, am talking about the guys who do it with virtually every horse who enters the barn, not one or two diamonds in the rough, nursed back to race well by real horsepeople. Standardbreds are there for the picking, mainly because they're "standard" - they race only one mile. If a horse improves ten lengths it's immediately noticed and there are very few excuses the public buys. In the thoroughbreds, a guy can pop a new horse in a 7f race, instead of a six, and use the extra furlong as the reason, along with all the other excuses like the jockey change or feed change. It's like Ben Johnson circa 1987. He's running the 100m in 10.20, and eight months later he's running it in 9.90. It's noticeable and people questioned it. If he switched to the 200m and ran a world record, he could easily say "it's my distance" and people wouldn't suspect a thing. Harness racing is not clean and neither is the thoroughbreds. But I'd like to see harness horsemen labelled "horsemen" not chemists more often. There are chemists in both sports, not only one. It's time world class harness horsemen got a fair shake. Over the past few months it's maddened you, as it has me. Industry insiders, horsemen groups, apologists for racing and press release after press release extolling the virtues of big slot purses at NYRA. If you read them, or those releases, you'd wonder if the business even has customers. I like to call what's been happening "Ontario, circa 1998". At the heart of the matter is the concept that raising purses makes everything sort of sustainable, I reject, I reject forever. Brav-freaking-oh. Horseplayers and folks who've lived through the concept of putting all the slot cash into purses and watching it fail miserably, applaud you wholeheartedly. A shiny new paddock, a new posh bar upstairs at a venue where 89% of handle now comes from off track, purses up the wazoo that make no sense will not increase your business long term. It's nice that someone other than dumb bettors and a few bloggers are starting to say it. Can a takeout reduction be coming? Better bets? More marketing cash? I'd bet on it. NBC Sports Network Hockey Ratings Through the Roof. Can Horse Racing Follow? Earlier this year the ratings for the NBC Sports Network were brutal, and we surmised it might not bode well for their horse racing coverage. Although I have not seen ratings anywhere for the Florida Derby or Spiral (always a bad sign I guess), the network did give out some good news today on their NHL Playoff Ratings. Wednesday's and Thursday's combined coverage of the 2012 NHL Stanley Cup Playoffs on both NBC Sports Network and CNBC combined for a total audience of 5.37 million viewers, a 31% increase versus 4.11 million last year, when NBC Sports Network, then known as Versus, was the only channel to show games. Can racing ride the coattails of the NHL? Well, if getting some commercials being seen in front of more sports fans is an elixir, this may portend something good (when compared to a few weeks ago anyway). I have always felt the way the Slots at Racetracks directive was handed down last month was bad policy. "Cold turkey" is something we eat, not something we do with a multi-billion dollar program. There's one thing about bad policy, in my opinion. If you ask a simple question about the core of it, you don't get an answer. I have felt this was a proper way to implement this policy if the government was going to get rid of racing and slots, come hell or high water: Phase it out over several years, so the industry could prepare itself, sock some cash away; do whatever they want to soften the blow and become self-sustaining. I was dismayed somewhat when racings leadership wanted to discuss "subsidy versus partnership" or blockades, or protests.I think from day one we should've been asking for a phase out and how to implement that phase out/reduction fairly. When the OLG CEO cannot answer a simple question about fairness, it's shows weakness. Horse racing, in my opinion, should completely shift their strategy and try and exploit that weakness. Yesterday's racing proves how exciting the sport can be, and illustrates nicely the intersection of big events and betting that tends to drive it. The sport is simply an old boys club running for each others stakes cash without people betting their opinion. In the Blue Grass, Dullahan proved his fantastic turn of foot is not a mirage with a super-close to win, going away. If you like this horse for the Derby, you certainly have a hot colt. I am still not convinced he's 100%, and I'm not sure that's a bad or a good thing, but that was one of the more exciting moves of the Derby season. Keeneland proves once again it is the premier racing venue in the land (in my opinion). For years folks slammed them for poly, but that is one big mirage. Put on awesome events, care about customers, allow ADW's - even small ones - to have your signal, and innovate. You'll be fine. Yesterday's BG card provided them with a record handle and a record attendance. The Oaklawn weekend was not quite a climactic as usual, I thought. The Apple Blossom wasn't very interesting, and compared to the BG the Derby was not quite up to snuff for me. But the races themselves did not disappoint. If I wrote in three weeks we're looking at a monster with a shot at the Triple Crown by the name of Bodemeister, would anyone be shocked? I thought Dullahan was impressive, until that horse annihilated them in a fast time. Can anyone remember a more contentious Derby season? Just think, Alpha, who any other year would be a talked about colt, is relegated to an afterthought. The Juvy winner, who garnered all the headlines, could come 14th in three weeks, and no one would be surprised. Union Rags, everyone's Derby pick and after doing virtually nothing wrong now has his name followed by "but". Amazing! What a first Saturday in May we're up for. DeRosa ate some crow on the Twinspires blog today regarding his thoughts regarding Dullahan. We were chatting on twitter last week and he said the horse had "no chance" in the Derby (he might be right, the Derby hasn't been run yet), and then he got into it with a bunch of folks. I remember five or six years ago now, Ed commented on my blog, and it was caustic and odd. I had never even heard of the dude, but my thought at the time was "who is this goof?" Over the years I have come to know him better, and although he is opinionated on racing (not unlike yours truly), he has become someone I chat with fairly regularly. There are a ton of people out there in racing who won't take a stand on something because they have no guts. DeRosa had to eat crow because he had an opinion he was willing to share. That's never a bad thing. After yesterday I think I'd have to have my head read not to move Bodemeister to the top of my Derby list. Right now I'll bump him to #1, followed by Union Rags, Alpha, Dullahan and Creative Cause. Ron Burke on twitter mentioned that Sweet Lou uncorked a nice 152 training mile. He looks on track. Balmoral's handle continues to sky. We'll talk about that next week on Harness Racing Update. Speaking of HRU, today harness handles - the ups and downs - are looked at (pdf). For all of yesterday's stories and updates, they're all on Goatzapper.com. The horse racing community is pretty tight, unlike any other sport, in my opinion. I think our turf writers generally like participants, and their horses. Some of them write usually glowingly about a performance, or a training or riding job, and quite a few gloss over the opposite. In contrast, if a goalie, quarterback or field goal kicker wears the goat horns, you'll read about it. One person who treads where many do not in horse racing is Twinspires' Derek Simon. His handicapping insights are good - he clearly knows what he's doing when he opens the PP's - but he pushes the envelope more often than not, and to me, that's what makes him stand out. Yesterday he spoke about Horse of the Year Havre De Grace and her late speed figures, and (lack of) bullets. As most know, she is skipping the Apple Blossom (apparently) because the connections do not want that weight assignment. He's not taking that at face value, as he shouldn't. Regardless, I am not sure I've seen an article about racings Horse of the Year titled "Havre Disgrace", have you? In what I speculated may have been a career-defining ride in last weekend’s Dubai World Cup, Sutherland dropped the ball… screwed up… fumbled… struck out — pick your favorite analogy. one thing seems abundantly clear: Sutherland is not yet ready for the big time. I thought it was a bad ride too, but I didn't expect to read about it in the mainstream racing press. Being "shock" or overly critical is a part of column writing in sport's and you can usually see right through the people who go down that road: Some overuse it, and it can be really annoying. As well, I believe half the people who use the technique do so to cover up their lack of understanding of what they're writing about. It's pretty rare to find someone who is incisive and smart, and willing to go out on a limb. I think Simon is that, and it's why I read him regularly. Well that was an interesting day for racing fans, wasn't it? Starting with the end of the day first, Horse of the Year San Pail, at 5 cents to the dollar, was defeated by Mister Herbie in the Glorys Comet Final at Woodbine, with Windsong Geant a bang-up third. Shocking, stunning? I don't really think so. San Pail, off the layoff looked fantastic, but if you watched him closely last week as a handicapper, he was working very hard and was not as willing as we've seen him. And of course, his competition is a little better this year than last. That's not a redboard, we talked about it on twitter. And yes, some industry types called me names for thinking he may go down to defeat. Hey, it's twitter. It will be interesting to see if he is a 151 and change trotter this year as an 8 year old. If he is, he likely will not win the majority of his races. For goodness sakes, he's 8 so we shouldn't expect him to, should we? He's a fantastic horse no matter what happens from here on out. Golden Receiver won the Toronto Pacing Series, or whatever we're calling it now, by open lengths. Randy toyed with them in the legs - showing he is one of the better thinking drivers around - and saved the best for last. He blew them away. On to the Derby preps. The Wood. Gemologist won and received a nice number. Hmmm: Pletcher, perfect trip, looked soft at the end. That's a trifecta that I don't want. If you like this horse good luck and maybe you'll be right, but I don't have him hitting the ticket in a month. I liked Alpha quite a bit, actually. He flashed his kick, but flattened somewhat, which is exactly what horses who are short tend to do. He'd been off for quite awhile and maybe KM has him exactly where he wants him for a 10f gruelfest in May. The SA Derby. I have not watched more than one or two races at Santa Anita in over a year, so I have no idea how that track plays, or what the time was like. All I do know is Creative Cause had a nice trip and lost, and it's weird to see equipment changes after wins. I'll Have Another is a top horse so there's no shame in losing the Derby to him, but the fact that a Baffert bomb was up close makes me wonder. At Churchill I worry about retention for I'll Have Another, as well. I'm not sure about this one, but I'm pretty sure I don't want to bet any of these horses in the Derby. You? The Illinois Derby. The favorite didn't flatter Gemologist any with that performance. The winner got a nice trip, the time was slow, and I don't think it'll shake up the Derby rankings too much. I thought Our Entourage would race better, but it seems with most Toddster horses, what you see is what you get. They fire and don't seem to progress and peak. Who did you like yesterday? What did you think? A month or so ago I thought Union Rags and Alpha were the top two Derby contenders and I still do today. I am super stoked to see Hard Candy and Dullahan race next, though. Hope everyone had a great day!!! Note: For those of you who like to talk international racing and what it can do for us as a sport, please see today's harnessracingupdate, for a column on that, with comments from blog friend Brett Coffey. One wonders how racing does the same things over and over again, finds out its a bad idea, but does it again anyway. Last Friday in the high court of Australia, old time racing (the Tote) took the Corporate bookies to task. In this round the high court went with the TAB, and imposed a turnover fee on any of the corporate bookies, which essentially keeps TAB's monopoly in place. Who does this hurt? You guessed it, the bettor. Ironically, this is the same Peter V'Landys who said the sky would fall when punters were given choice, with the corporate bookies. V'landys: "This is the biggest problem the racing industry has ever had, because this is a direct threat to its funding levels." Then again: "It has a massive impact. As I said, 70 per cent of our income comes from wagering, so if that money is being pilfered out -- and we are not getting paid to put the show on, it means that all our 50,000 participants in the end will lose." I think it's kind of funny that there are still 50,000 people (using his own two quotes, years apart) employed in the industry after such a dire warning. What really happened, is that in 2011, two and a half years after these bookies who "pilfer" were allowed to operate, Australia had a record handle, and record purses. Of course the people who understand gambling and gamblers get it. So let's get this straight: Handle went up, revenue went up, and Peter V'Landys wants to stop it? In the future, handles will fall - because punters aren't playing racing like its a charity, they want choice and a chance to make money - and what will V'Landys do then? Probably find something or someone else to blame. I hope people learn that you can't squeeze your customers, stifle their choice, and make it harder for them to enjoy your sport, and expect to grow. I hope so. But it's not very likely. Racing needs one huge house cleaning. On my first trip to Keeneland many years ago now, I was truly amazed at the place. Not only were there like-minded racing fanatics and bettors like me there, the place was, well, the place. The people were friendly, from the tellers to the man or woman cleaning up the lose tickets on the ground. The food was pretty good, the atmosphere tremendous. And the betting, well it was good too. All the qualitative factors that I like in a track were there, and the it seems the quantitative ones are too. 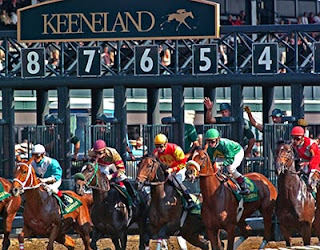 Again in 2012, Keeneland was ranked the best track on the continent in terms of horseplayer and handle value - takeout, field size, pool size, wager variety, etc - by the Horseplayers Association of North America. One thing that strikes me about Keeneland is the constant want to get better. I have, over the years, met or presented on panels with horsemen folks, track execs, government people - the people who control our sport. Almost all the time the discussions are cordial and I learn something. One executive that stands out in many ways is Keeneland CEO Nick Nicholson, though. At a meeting not long ago, and one that tends to happen every year, he asks people like me and you, "what can I do to make this place better for our customers". It's the first thing that comes out if his mouth. Most people start conversations like that with "well, I can't do much because of a,b, or c", but not with him. By asking players what they want, he's delivered as well or better than any exec out there, in my opinion. Players like Trakus. Keeneland has it. Fans like HD pictures. Keeneland has them. Players like lower rake, Keeneland has it. Players like nice field size, Keeneland has it. 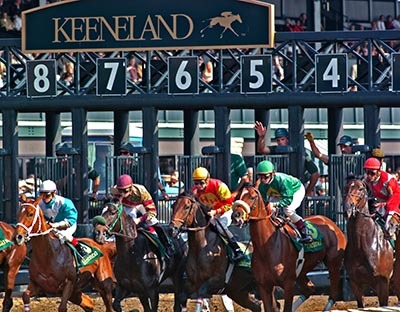 Smaller players love wager variety and incremental bet size, Keeneland has them. Smaller players will embrace fractional wagering. This year, Keeneland has it. Bettors want to bet at the track via mobile device, Keeneland has it. Even polytrack was a pro-bettor idea in the beginning, no matter how it turned out, or what anyone thinks of it now. He had a speedway with an inside bias, spring weather made the track a bog. By installing poly, it was hoped that field size would increase, sloppy tracks would never again return, and they'd have a better racing product to increase their betting business. When some folks started to complain about it, they didn't wring their hands, they created a polycapping database on their website, which yields angles for sharp players. They also worked diligently with track maintenance crews, trying their best to get an unbiased surface. The Keeneland surface of 2011 was much different than its original several years earlier. One day, and this day is coming, every track will have to rely on one thing and one thing only to survive and thrive: The betting customer. At Keeneland you are not a necessary nuisance, you are a big part of why they exist. Note: To see the ratings and metrics for all 68 tracks in North America, it's here.